Strömsund is literally a gateway to the wilderness. Follow in my footsteps and fold westward to start your adventure into the area of Sweden, most dense with bears per square kilometres. Keep to the Vildmarksvägen road (the Wilderness Road) and make detours to waterfalls, caves, mountain hikes, sami dwellings, marvellous fishing spots and enjoy the wildlife of this northern part of Jämtland. The Wilderness Road in the mountains close to Norway. Photo: Madeleine Aaras. 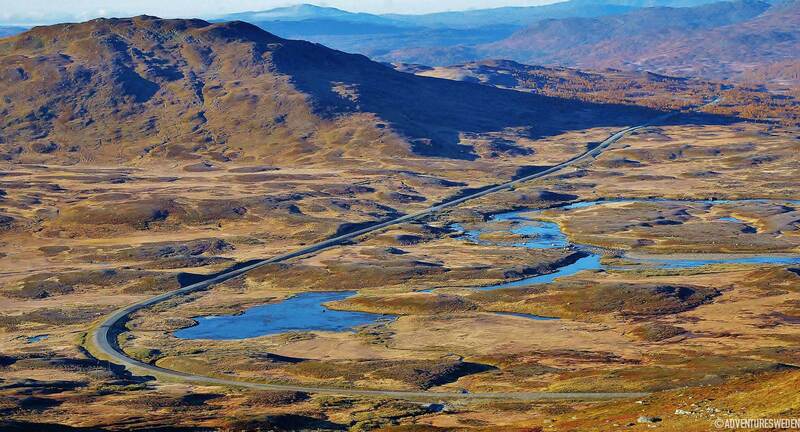 The scenic Vildmarksvägen road in northern Jämtland leads up along the waters of Ströms Vattudal to Gäddede, past Stora Blåsjön and the mighty mountain plateau of Stekenjokk, further into southern Lapland to the community Vilhelmina. A distance of more than 500 kilometres, if you also count the way back to Strömsund along the Inlandsvägen (road E45) road. I had done the tour before, and so this time I went straight to my hotspots. This is also a trip into the land of the magical cartoon figure Dunderklumpen. Swedish artist and performer Beppe Wolger created the figure in the 1970s, and made a movie with both cartoon characters and real actors. It is mainly a story of friendship and that no one can stand alone for the long run. All recorded in the beautiful scenery along the Vildmarksvägen (wilderness road). I just love all the characters in the movie and I stopped by the homestead museum in Strömsund to see them on display and get in the mood for my trip. The first part, along Ströms Vattudal (Ströms waterways) towards the community of Gäddede bordering on Norway, is a beauty in itself, with dense forests and a pearl string of small and large waters attracting fishermen from all over the world. There are both trout and char in quantity, along with whitefish, grayling and pike. But fishing was not on my list, not this time. The mighty waterfall Hällingsåfallet creating constant rainbows and a humidity suitable for rare lichens. After a couple of hours drive along the road I reached the powerful waterfall Hällingsåfallet, Sweden’s response to the Grand Canyon. The river Hällingsån rushes down a 45 meters high cliff, down into Sweden’s longest canyon. There is a constant rainbow and several rare lichens thrive in the mist caused by the fall. The road up to the fall is a bit bumpy at some parts so this time I decided to hike the last part along the canyon up to the fall. As I got closer to Gäddede I chose to go by Viken chapel and the village Sandnäset to buy some thin leavened bread at the Jämtlands Tunnbrödsbageri. The elderly couple running the place has been baking bread for over 50 years. The whole production is eco friendly and they have won several gastronomy prices. 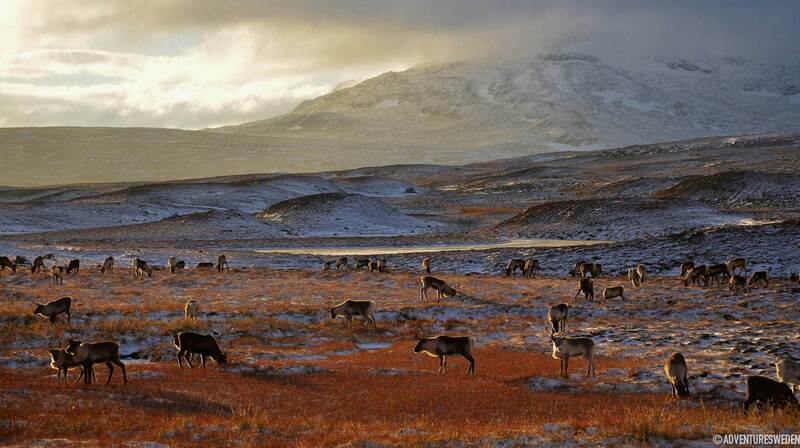 You are most likely to catch a glimpse of reindeer along the Wilderness road. Photo: Madeleine Aaras. About 10 kilometres north I reached the mountain farm Jormliens fjällgård. The view from the farm is stunning with the lake and the mountain Lill-Jorm. I stay overnight to start early the next day riding. – Ever since the end of the 19th century tourists have stayed at this farm for food and lodging says the host, who has run the guest house for more than 25 years. The mountain farm is open in both summer and winter and you can see there are many regulars since they all have their own coffee mugs with their names on, hand painted by the hosts daughter in law. The host Kenneth prepares a reindeer filet with chanterelles for dinner, served on a wide plate reminding me of the nature outside, with flowers and cloudberries, from the nearby mire, for decoration. I woke up early from the sound of cowbells and the voices of mountain cows. Ola and Elin where waiting for me in Jormvattnet. Together they run a “Natures best” company, Korpens Öga, with a menu of adventures. Last time I was here I went for a guided hike to the nature reserves of Sweden´s longest cave Korallgrottan and the mysterious river Bjurälven leading both underground and above ground along its course. I still marvel at the ongoing project, Expedition Bjurälven, were they are continuously mapping the underground parts of the river. For more than 10 years an international group of speleologists have met here to map the underground system of caves and streams. This time I was to follow them riding on icelandic horses, viking style, up towards the mountains Jormruet and Klumplidklumpen. – There are endless possibilities of riding here in the borderland to Norway, Ola says when we took a lunch of fried reindeer meat, “souvas”, wrapped in thin leavened bread, after a few hours riding. Then we got talking about the movie Dunderklumpen. – This is exactly where Beppe Wolgers found his inspiration to make the film, Ola said. Riding back to the farm “Korpens Öga” (the eye of the raven), we stopped to pick ripe cloudberries and chanterelles. They are easy to spot from the comfortable height of the icelandic horses we were riding. After a visit in the woodfired sauna and a refreshing cold bath in the lake it is time for dinner in the longhouse inspired by the rustic building style of the vikings settling on Iceland. We dug in eagerly as we were served delicious char and cloudberry icecream. The next day I turned towards higher peaks. First a visit to the sami church village of Ankarede with sami wooden huts and the white chapel from the 19th century, just by the outlet of the lake Stora Blåsjön. I made a reminder to myself to come here at midsummer one year, to be a part of the grand celebrations or maybe for the christmas market in Advent. I settled for the four kilometer hike from Ankarede to the waterfall Lejarfallet instead of threading the 30 kilometer hike to the valley Härbergsdalen further east. A couple of kilometres north of Ankarede I ventured the grand high plateau of Stekenjokk 900 m a s l, surrounded by several 1000-meter high peaks. I could see all the way into Norway and further into south Lapland. The road over the plateau is 16 kilometers long and is only open in summer. It takes weeks every May-June to plow through the three metres high mass of snow covering the plateau. The road usually opens the second week of June and is open til October last. Now it was time to use the bike I had strapped to the back of my car. Stekenjokk holds some of the best mountain cycling of Sweden in my opinion. Thanks to this being an old mining area, where copper was mined from the seventies to the late eighties, there are some 300 km of gravel roads and paths perfect for easy cycling. I took a break for a sip of water on the top of mount Tjaallinge, 1.122 m a s l, according to the map I was holding. In good time for dinner I reached Klimpfjäll and the farm Norgefarargården (the travelling-to-Norway-farm). This was once the last stop for trade farmers going to Norway to exchange furs and other goods for salt, sugar and silk by the norwegian coast. There is a café in the old Inn, up high with views over lake Kultsjön, the mountains Marsfjället and Autjoklimpen. After a delicious meal the owner offers to give me a ride back to my car! Clearing the Stekenjokk passage from snow in May-June. Fatmomakke is my next stop, it is a sami church place along the upper side of lake Kultsjön. There are some 80 sami huts and 20 log houses along with the church in the village dating back to the 18th century. I ran into a couple of hikers with huge backpacks. They were on their way up to mount Marsfjället 1.600 m a s l.
At this point my journey was coming toward its end. Remaining was a visit in the mountain village Saxnäs and the homey old church village of Vilhelmina, before I went back to Strömsund by the Inland road. There is a rich variation of plants along the Wilderness road with mountain flowers, lichens, rare orchids as well as mushrooms and berries in the late summer and autumn. The municipality of Strömsunds holds some 250 km of the Wilderness road and this part is also the richest area in terms of the number of brown bear per square kilometer in Sweden. There is also a good chance of spotting moose, lynx, wolves, mountain fox and eagles. There are grocery stores as well as restaurants in Strömsund, Gäddede, Stora Blåsjön, Klimpfjäll and Vilhelmina. In addition there are cafés and local food artisans selling their products from their farms.